Day 1: Meet at Aswan Airport or railway station and Transfer to embark MS Amarco Nile Cruise before lunch. Check In and lunch on board then visit the High Dam and Nubian Village. Dinner on board & Overnight in Aswan. Day 2: Breakfast and Sail to Kom Ombo. Lunch and Afternoon tea then visit the Temple of Kom Ombo. Sail to Edfu, dinner & on board in Edfu. Day 3: Morning visit Horus Temple in Edfu then breakfast on board and Sail to Luxor. Lunch, Afternoon tea then visit Karnak & Luxor Temples. Dinner, belly dance show on board & overnight in Luxor. Day 4: Breakfast on board then check out MS Amarco Nile Cruise. Visit Hatshepsut Temple and Colossi of Memnon. Transfer to Luxor Airport or railway station for departure. Day 1: Meet in at Luxor Airport or railway station then transfer to embark MS Amarco Nile Cruise before lunch. Lunch on board then visit Karnak & Luxor Temples. Dinner & Overnight on board in Luxor. Day 2: Breakfast on board then visit Hatshepsut Temple and Colossi of Memnon. 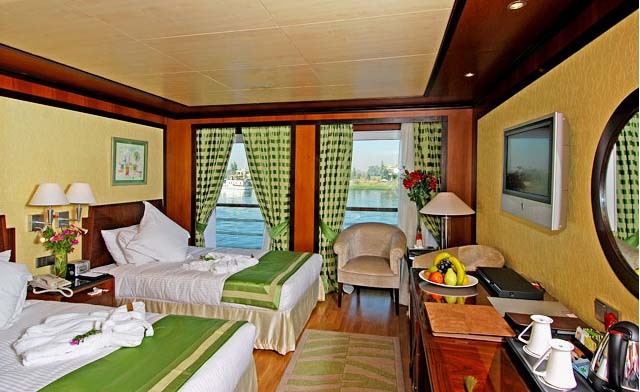 Sail to Edfu, Lunch, Afternoon tea, Dinner & Overnight on board in Edfu. Day 3: Breakfast then visit Horus Temple in Edfu. Lunch and Afternoon tea while Sailing to Kom Ombo. Visit Kom Ombo Temple then Sail to Aswan. Dinner & Overnight on board in Aswan. Day 4: Breakfast then Visit the High Dam and the Nubian Village. Lunch, Afternoon tea, Dinner & Overnight on board in Aswan. Day 5: Breakfast then Disembarkation MS Amarco Nile Cruise and Transfer to Aswan Airport or railway station olossi of Memnon. Transfer to Luxor Airport or railway station for departure. Restaurant serving International cuisine (buffet & a la carte).